This is for all the pound cake lovers out there. I fail to track the number of pound cake recipes I had worked through Tish Boyle's The Cake Book. I think very soon, I would find myself baking through the whole Cake Book - it is just so reliably good. This recipe is modified from Tish Boyle's Rich Marble Pound Cake With Chocolate Glaze. I have chosen to skip the frosting and keep it simple. I have also chosen to marble it with a pistachio flavoured batter rather than the chocolate one featured in her book. The effect is quite lovely as I had imagined. In place of the dark brown swirl, the jade green marbling instantly brightens the otherwise plain pound cake and makes it look... brand new. Talk about a cake-makeover! I am going to keep this post short as I am rushing to tie things up before I leave for my travels again. Have a great weekend everyone and enjoy the pound cake! 1. Preheat oven to 325F/ 190C. Grease the inside of a 10inch bundt pan and dust with flour. 2. Sift Cake flour, baking powder and salt and set it aside. 3. In a mixing bowl fitted with a paddle attachment, cream butter at medium speed for 2 minutes until creamy. 4. Add sugar and continue to cream for 4 mins at medium to high speed. 5. Add vanilla extract. Add eggs one at a time and mix at medium speed until well mixed. 6. Add sifted flour mixture in 3 additions and alternating it with 2 additions of milk. 8. Spoon 1/3 of plain batter into the prepared bundt pan and smooth it to an even layer. Spoon 1/3 of the chocolate (pistachio) mixture over the plain layer and smooth to even out. Repeat until all batter is used up finishing with the chocolate layer. 9. Bake at 190C for 60-75mins or until the skewer comes out clean. 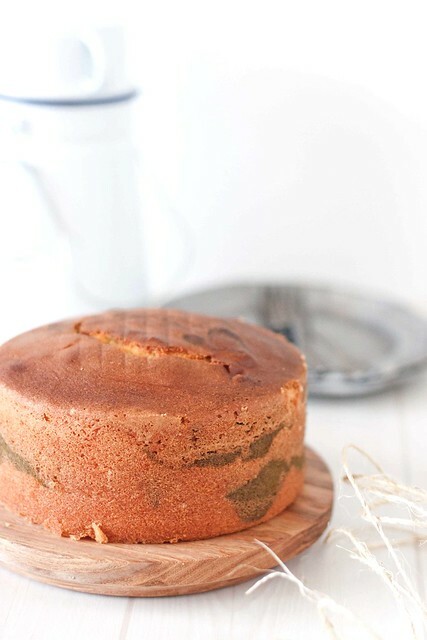 Hi, saw your marble pound cake this morning, my hands are itchy now.. hehe. May I ask where can I obtain Pistachio paste? Self made? Thks. 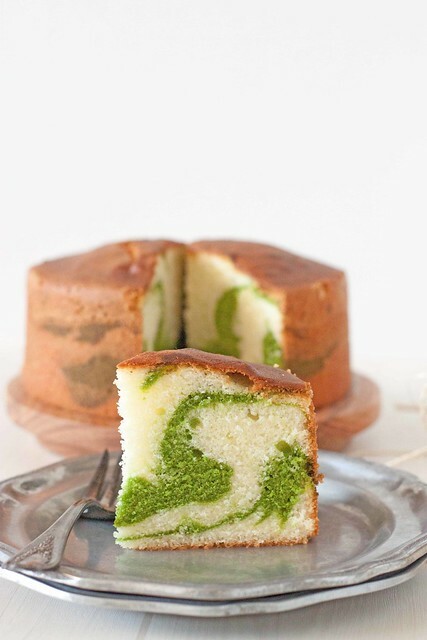 I have bookmarked Trish Boyle's plain pound cake but now you come with another beautiful pound cake, now i can not decide to go with which one first, hehehe..Great choice to replace cocoa with pistachio, very lovely green swirl..maybe i should try this one first..Have a nice vacation..
Lovely swirls there! I would live a big slice. It's too bad my girl is allergy to pistachios, so none of that will appear in my kitchen. Btw, you've convinced me to buy Tish Boyle's book! Safe travels! Jocelyn- I got my paste in Hong Kong but Sun Lik carries it. You can get it there. Lovely pound cake! Would be nice to eat with a cup of tea. Definitely a very pretty and stricking cake. I have Tish Boyle's book by the way. That looks absolutely beautiful! Each time you post a pound cake recipe, I think its the most beautiful pound cake I have seen, only to be proven wrong by your next pound cake post. You are the pound cake queen! If I were you, I would have squeal in delight to see those pretty swirls!!! You are such a talented baker- with contemporary photography skill! A beautiful cake! Love using pistachio whenever i can and this is one perfect opportunity! What a gorgeous cake. The marbling effect is absolutely stunning. 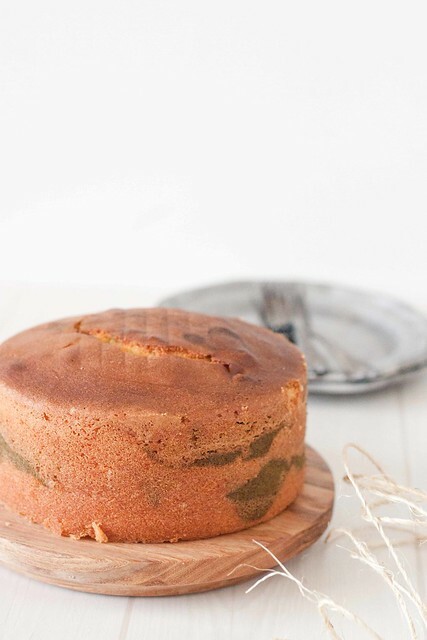 I've made a green tea pound cake that I loved so I'm sure I'll love this too! It's so pretty. I like the look of the crumbs. That's a beautiful looking cake, and great photo too! Wish I could make one too, but I doubt I can find pistachio paste here. The colour is really stunning! I've just discovered you through Foodgawker: great recipes and wonderful photos! The pistachio swirl is absolutely beautiful. Very nice cake - especially the swirls. I love how you presented it. The green swirls got me convinced! what a lovely combination of colour! (and flavour!) Pistachio paste makes a better jade-like colour than green tea.. This is one of the prettiest pound cake I even seen. 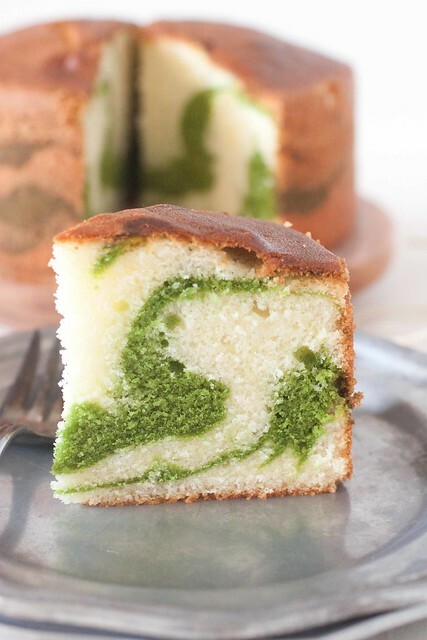 I love the combination of the white and green on the cake. looks beautiful! i love pistachios, so i'm sure it tastes great as well!! the marbling swirls looks really incredible. I can't stop staring at the beautiful color on your cake! Simply gorgeous! The green pistachio swirls are reminiscent of our early spring here in California. A tempting cake indeed! 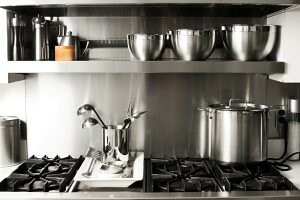 Can't you make your own pistachio paste? Just put some pistachios in a food processor? @Anonymous - You most certainly can. With a powerful food processor and sugar (maybe a little oil) ... almost like making peanut butter. I don't have a recipe for that, though - unfortunately. Hi Shirley... I baked this last night and it tastes wonderful . Not too rich. My family loves it. Instead of pistachio, I used cocoa powder and kahlua. Yummy. Thanks for sharing the recipe. I am so going to buy this book.